A fun family Halloween Mystery Party (non-murder) for all ages, 7-14+ players! Ideal for families, church groups, youth groups, classrooms, or anyone who wants good clean fun on Halloween! You can expand the main game to 20+ characters and there is an expansion pack available (5M,5F) to expand to 40+ characters by playing certain characters as teams. This is the instant download upon purchase version of the game - no waiting, no shipping fees! Easy to host, easy to prepare. Click here to view the character list! Click here for the free, printable invitation! Click here for the 10 character expansion pack! Click here for the sample game. 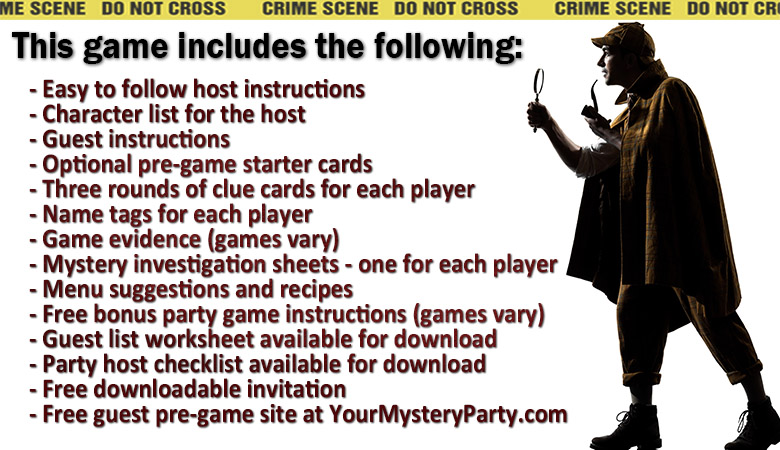 Click here to have My Mystery Party staff prepare your game kit! For non-murder mystery games, there will not be a victim sign included. It’s time again for the Pumpkin Town Annual Halloween Celebration traditionally held at the Pumpkin Town Recreation Center. The town’s people are set to arrive on the scene in their best Halloween fashion in anticipation of the annual ultra-competitive Pumpkin Carving Challenge and Giant Pumpkin Contests! The guests will kick off the party with spooky food while having a blast competing with fun Halloween party games! It is rumored that some guests may have shocking news to unveil while others have been reported to be acting strange as ever. Let’s hope all goes as planned on this night in Pumpkin Town! In addition to the fun Halloween mystery party game, you'll receive fun bonus activities! Follow My Mystery Party's board The Wacky Pumpkin Town Panic - a Fun Halloween Whodunit - Mystery Party (non-murder) on Pinterest.